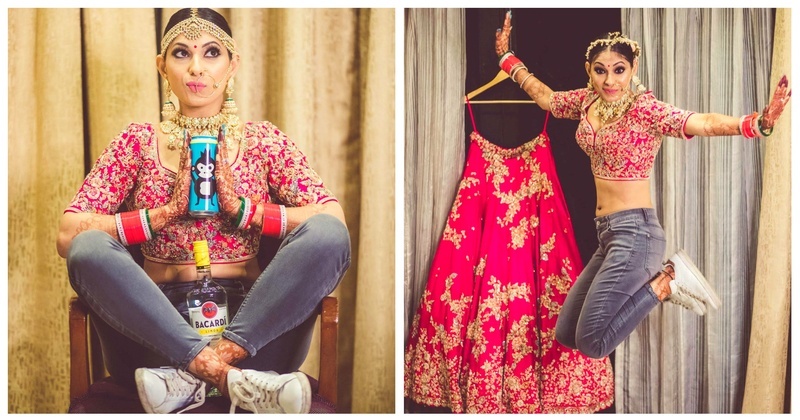 This not-so-regular bride with an infectious smile and a gorgeous pink lehenga has the coolest bridal pictures ever! Happy brides are the prettiest right? Meet Rashika Yadav, a not-so-regular bride with an infectious smile and a gorgeous fuschia pink lehenga! She kept her bridal makeup subtle but completely party-ready. Love her dramatic eye-makeup with dense lashes, prominent blush and the dash of pink on her lips. Although, what takes up all the attention is the mini bindi on her forehead! I am crushing over her fuschia pink lehenga skirt with floral motifs and zari embroidery paired with a heavily embellished choli. She completed the look with sheer double dupattas with one being in the same colour family and another being a light pastel shade totally setting some fresh goals. The bride's part traditional, part modern and totally fun looks combined with Design Aqua Studio’s exceptional photography skills made this wedding one of the most special ones that we've come across.